This omni-directional conference microphone picks up clear audio with a 360 degree range. Its rubber feet keep it in place and plugs into your computer via USB for clear, digital audio. The CM-1000-USB can be daisy-chained with up to 3 additional microphones to ensure a wider range of coverage. This requires CM-1000s and uses the 3.5 mm female jack on the back of the microphone. 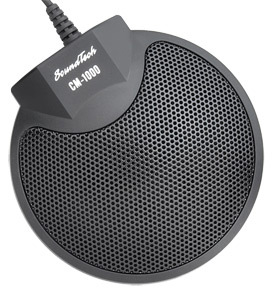 The single CM-1000-USB then provides the audio from all the CM-1000s to the computer.